Went out for a nice Prime Rib dinner with the wife tonight. First thing we order is water with our drinks... never shows until we ask for it again. Then my steak comes out with exactly three shriveled up and sickly looking steak fries. Waitress says she'll bring 'em out once the new batch is ready. 45 minutes later, my steak is gone, the three crappy fries are gone, and my new fries still haven't arrived. In fact, the check shows up without even a mention of the fries. The waitress was nice enough to bring out some fries (once we asked about it, again) with my wife's to-go box but by then I was full, pissed off, and not looking to eat anymore. I know places are busy tonight, but seriously, WTF? Has this ever happened to you? I know it's just fries and water but it just makes me SO mad! Ugh, I hate it when that happens. For me, I get more pissy than usual when I'm hungry (low blood sugar), which only exacerbates the situation. Sometimes I feel held hostage through the situation because you've ordered and then you've started eating...horrible. You should do the right thing and tweet crap about them ;) just kidding, maybe you should give the owner a call, no place goes in business intending to provide poor service and I'm sure they would make it right. LOL! It just feels better getting it off of my chest.. I have a feeling this place won't be in business for long. Last time I was there, they gave me a well done piece of meat when I asked for medium rare and then told me that I would have to wait another hour if I wanted a less done piece. The funny thing is that if I just hadn't gotten upset, the evening probably would have been much better... I think I'm just cranky from being outside all day. I need a nice stiff drink, a shower, and a nice night's rest! How about you Josh, anything fun or frustrating for you today? I went out to show a house. The listing said it was vacant, so we didn't make an appointment. Showed up and the house was occupied. Wasted an hour, made an appointmen to go back tomorrow. Hopefully they'll like the house, make and offer and I'll make some $$$$ to support my wine habit. 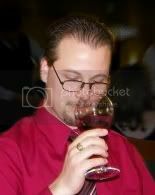 Went downtown to interview the wine steward at a local wine bar. They have over 1100 bottles. I was pretty damn impressed. Video and review should be out by Monday. Now, we're going to watch a movie. Sounds like you've had a day filled with ups and downs too! Hope you enjoy the rest of your evening! We were going to try to catch Sherlock Holmes but will probably wait until tomorrow! Which one are you seeing? We rented Transformers 2 and GI Joe. Watched Transformers. It was ok. More of a kid vid, but the scenes with Megan Fox were hot. I watched Transformers 2 on the plane last October and was kinda disappointed (not with Megan Fox). Just wasn't as good as the first... I think the novelty kinda wore off. I'm sorry about your dinner! That really stinks because the whole purpose of going out to dinner, at least to me, is to avoid the hassle of making/cleaning up dinner. Dinner out should not be a hassle! Next time, go somewhere else! As for the little movie sidebar, we watched Four Brothers last night. It was more of a guy flick but it wasn't bad. I have regain control of the Netflix list. LOL! Control of the Netflix list is VERY important! How do you decide which movies to add to your list? You probably should have mentioned something to the owner/manager. That will help them know there was a problem, as otherwise they might never know. And if they don't know, they can't fix it. The owner/manager at this particular place used to walk around and check on everybody... haven't seen him around lately. Maybe that's part of the reason for the bad service. In any case, you are right, I probably should have addressed the issue with him. Next time, I'll give that a try! It still is not too late to send them an email, or drop a telephone call. You know what... you're right! I'll stop being a chicken, and give them a call! We always reach out to customers who review our restaurant poorly. I know we have high quality food for a fair price. Usually something extraordinary happened or sometimes people came in already mad about something else. Most of the time we offer a gift certificate, free wine or even a free meal depending on the situation. I would suggest contacting them through yelp, opentable or some other public forum. If they are worth a crap they will respond. I have always told my GM it is better to have someone write a negative comment than to be so uninspired that they did not write any comment. As they say the opposite of love is not hate, it is indifference. Shame on you for going back. Ok, I guess everybody gets a second chance. Richard, I actually spoke to a restaurant manager one day and he threatened to "break my kneecaps" for complaining about his food. Nice guy, huh? He even wanted to fight me in the restaurant. I then made sure that everyone standing in line heard the commotion and he lost the next 8 tables who all walked away. I only regret not dropping him where he stood. But he also had 2 large guys from the kitchen beside him. This is one restaurant that would never get a second chance. In fact, I canceled the credit card bill immediately after leaving the restaurant. To the movie note, have you seen The Hangover? Funny movie. 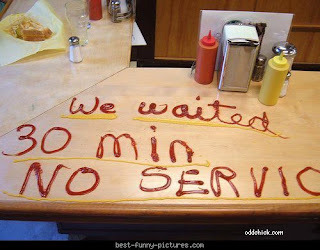 I just got pissed that they screwed me on the service... at least I didn't get into a fight with the owner/server! That's hilarious! YES! That was an awesome movie... when I heard people talking about it, I was like, what's the big deal? Then when I finally saw it, I realized that it was actually pretty cool. Yes, some people should never manage a restaurant, and can't take valid criticism. I have spoken to managers who were indifferent to my complaints, though none of them ever threatened me. I saw the Hangover too and thought it was very funny. The Asian guy who was in the trunk was really hilarious. LOL! Yeah, I would say being threatened is quite impressive! Can't say that's ever happened to me either!